The graph shows the number of hits to two new music sites on the web, measured in thousands over a period of fifteen days. As far as Music Choice is concerned, the number of visits to the Site fluctuated between 20,000 and 40,000 in the first eleven days, except for Day 3 when they reached 60,000. By contrast, visits to the Pop Parade Site fell erratically from approximately 120,000 hits on Day 1 to around 40,000 on Day 7. Between days 11 and 15 visits to Music Choice fluctuated dramatically, hitting a peak of over 120,000 on Day 14. 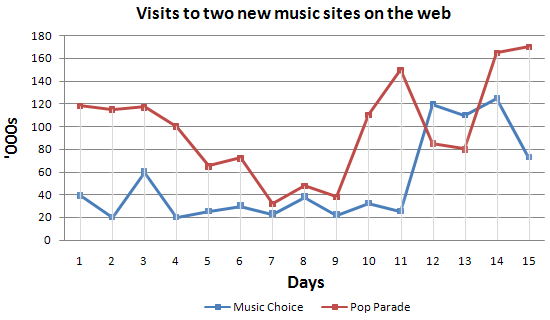 Despite a drop to less than 40,000 hits, Pop Parade Saw a huge increase in the number of hits between Days 9 and 11, reaching a total of over 150,000 hits on Day 11. At the end of the fifteen-day period the number of hits to Pop Parade peaked at around 170,00, whereas those for Music Choice Showed a marked decline to around 70,000.